The paper found in a terrorist's pocket holds six names—and single mom Rachel Reynolds is the only one on the list who's still alive. Private security contractor Jack Sergeant wants to ensure she stays that way, but first he must convince Rachel the danger is real. Rachel can't believe that someone's after her…until she's grazed by a shooter's bullet. She won't take chances with her son's life—but she doesn't want Jack getting too close. 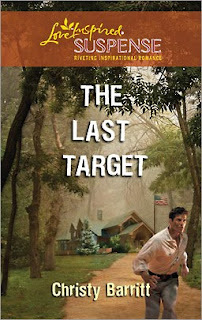 Yet as Jack comes to care for both mother and son, the target he's after is a family to love and protect for a lifetime. Rachel Reynolds scanned the playground for any signs of trouble. Unsupervised children. Bullies. Swarming insects. None. Just another day at the park for a dozen or so moms with their toddlers. Her gaze shot back to her son, four-year-old Aidan, who was playing on the other side of the waist-high fence, not even ten feet away. He climbed up the plastic steps of the slide—the tallest one at the park—and stopped at the top. "Look at me, Mommy!" His wide, brown eyes connected with hers and glowed with satisfaction. Rachel waved and wiped at the perspiration on her forehead. Even under the shade of the pine tree, the summer heat still felt sweltering. "I'm watching, honey." Just as he propelled himself down the slide, something hot whizzed past her arm. The smell of acid filled her nostrils. Pain sliced into her skin. "Get down!" A man shoved her to the ground, his body shielding hers. He reached into his jacket and pulled out a gun. His mouth went to a wire at his wrist. "We've got shots fired. I repeat, shots have been fired." Shots fired? Aidan. She had to get Aidan. She raised her head up, gaze darting around the playground. Mobs of children and their mothers fled the park, screams filling the air. Where was Aidan? Her gaze stopped at the slide. Aidan had climbed to the top again. She had to get him, to keep him safe. "Aidan! Aidan!" She twisted her body, desperate to get away from the man who'd thrown her out of harm's way. Her fingers clawed at the grass. Her legs thrashed. Her screams caught in her throat as a man approached the slide and grabbed Aidan. Her son's tear-filled gaze shot toward her, big eyes pleading for help. His arms reached for her just as the man who'd snatched him disappeared into the thick foliage of the woods. A guttural cry rose from Rachel. "Aidan!" She pounded on the chest of the man shielding her as tears pushed their way out. The other man was getting away…with her son. "That's one of my men who took your son. He'll keep him safe." Her heart slowed a moment. "One of your men? Who are you?" "I'll explain once you're safe." Safe. She had felt safe only moments ago. That was pretty much all she wanted in life—to, as a single mom, provide a stable home for her son. In the blink of an eye, that life had been turned upside down. What was going on? Why had someone opened fire at a playground? Were they crazy? She prayed no one was injured. She needed to thank the men who'd saved her and Aidan and then retreat home. Lock her doors. Call the police. File a report. "We need to lay low for a couple more minutes before I can get you out of here," the man said. How had this man known there would be gunfire at the park today? Tension pinched her muscles. How had he gotten to her just in time? He'd known the shooting was going to happen, she realized. She felt the blood drain from her face. What if he wasn't one of the good guys at all? She had to get away. Get Aidan. The man's large frame easily overpowered her, though. What could she do? She ran through everything she'd learned in self-defense class. She had to use the weapons God had naturally given her. Before she could reconsider, she pulled her elbow back and jabbed the man in the eye. "Get off me!" As he blanched, she clawed the grass, pulling herself to safety. Too late. The man grabbed her wrist and pulled her back. "Are you crazy?" Eyes wide with terror, she shook her head. "No, you're crazy if you think I'm going anywhere with you. Get away from me!" She tried to sock him in the jaw, but his strong grip clamped down on her wrist. "Listen to me a minute. Your uncle sent me." "I'll explain everything. But right now, I've got to get you to safety." The man's iron-like hand gripped her arm. "Come on, we've got to get you out of here." If Rachel wanted her safe life back, she had no choice but to trust this stranger. But the very thought caused fear to pulse through her. Jack Sergeant scanned the park for the gunman. The shot had come from the woods behind him. That meant he'd have to get Rachel Reynolds to the waiting SUV with only his body as a shield. A few pines trees would offer measly protection against a bullet. At this point, they had little choice. Rachel trembled in his grasp. Blood blurred across her skin. Fear seemed to seize her breaths. If only he'd arrived at the park five minutes earlier; maybe they wouldn't be in this situation. He'd think about that later. Now, he had to get the sweet-smelling woman out of here in one piece. He would have never guessed the gunman to be this aggressive or Rachel this stubborn. "Rachel." He looked down at her wide, perfectly sculpted brown eyes. Finally, her gaze locked with his. "On the count of three, we're going to run toward the street. You'll be in front, I'll be behind you. Got it?" She nodded, but apprehension showed in her shifting gaze. She was scared. She should be. This wasn't a game. Lives were in danger. Another shot whizzed above them. They had to move and fast. He'd never forgive himself if something happened to her or her son. "One." He shifted to the side, in position to lunge. A small cry escaped from Rachel. "Two." He tensed, ready to spring. "Three!" He rushed to his feet, grabbed Rachel, pushed her in front of him and charged across the grass. A bullet splintered the tree beside them. They sprinted toward the street at the park's entrance. Jack's body blocked Rachel. He was a good foot taller than her, and her strides couldn't meet his. He grabbed her elbow, propelling her onward. Only a few more feet. He looked at the street, now cleared of cars. Where were his men? In front of him, sweat glistened over Rachel's face. She pulled in ragged breaths. Her arms trembled beneath his grasp. Another bullet panged into a brown metal sign. Rachel gasped, froze for a moment. That had been close, mere feet away. Jack put his arm around her waist, urged her forward. An SUV pulled to a screeching halt in front of them. The door opened and one of his men motioned to them. The air electrified as another shot rang out. Jack grabbed Rachel, swung her into his arms and slid her into the backseat. He shoved in after her and slammed the door. Another bullet pierced the glass behind them as they squealed away. Jack could feel Rachel's heart hammering into his chest. As soon as she spotted her son on the floor, she reached for him. "Aidan!" The car swerved again and sent all of them crashing into the door. The shooters were still on their trail. Jack and his men had to lose them, get Rachel and Aidan to safety. "Hugs later." Jack reached over them. "Right now, seat belts on and heads down." He jerked the seat belts across them and clicked the buckles in place. Once they were secure and hunkered down, Jack grabbed his gun and looked out the back window. Two SUVs trailed them. Another shot hit the back windshield, shattering it this time. Luke Black, the driver, swerved, and their SUV skittered close to the ditch beside them. The vehicle righted before zigzagging down the road in an attempt to avoid the gunfire behind them. Veins popped out on Luke's temple, and he had a white-knuckled grip on the steering wheel. "We've got to lose them, Luke!" "I'm trying." He took a quick left turn onto a busy Virginia Beach street. They charged through the yellow light at an intersection. The pursuing vehicles darted behind them. Two bystander cars skidded to a halt to avoid a crash. Luke swerved again, this time onto a road that led away from the rush-hour congestion. The SUV nudged their bumper. Mark Denton, the other agent, stuck his gun out the window and fired, catching the front tire of one of the SUVs pursuing them. The vehicle jolted onto its side and rolled off the road. Rachel screamed and clung to her son. Where did this road lead? Jack thought quickly until a plan settled in his mind. He glanced at his watch. "Go to the drawbridge!" It was scheduled to open on the hour. If they could get there and get across it before the SUV behind them, they might escape. Rachel looked up with wide eyes. "The drawbridge? Are you crazy?" Maybe. But it was their only chance. "You've got to trust me." "I don't even know you!" The glass shattered on the window beside him. He threw himself over Rachel and Aidan, shielding them from flying glass and bullets. "No, but I've been hired to protect you." "Why in the world do I need protection?" "Because your name was found on a hit list. Everyone else is—" He glanced at Aidan and then mouthed the word dead. By the stark white appearance of Rachel's face, she got the message loud and clear. She ducked and placed herself over Aidan, kissing the top of his head. The drawbridge waited ahead of them. Red stoplights flashed on either side of it, and a line of cars had already begun braking in front of them. "The gates are going down!" Luke yelled. "We can make it," Jack said, adrenaline charging through him. "Step on it!" The SUV swerved into the opposite lane, charging forward toward the opening bridge. "Hold on tight," he told Rachel. He pulled his own seat belt over him as they crashed through the gates. He prayed to God that they'd make it.